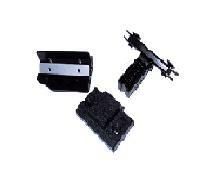 Technics Dustcover Hinge DJParts - All Variety of Parts that DJ Needs. This is original parts made by technics to Fit SL1200 and SL1210 series Turntable. Please note: One Hinge only connect one side of Dustcover to a MK2 turntable. To attach a dustcover to a cabinet You need complete 2 hinges to connect (1) Dustcover to a turntable.